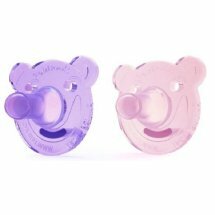 Philips Avent Soothie Shapes Pacifier 0-3m - 2 CT.
Philips Avent Soothie Shapes Pacifier 0-3m. The pacifier brand distributed in hospitals nationwide. The brand used by medical professionals to calm newborns. Conforms to US CPSC standards. Trademarks owned by Phillips Group.